Home / Babun / Shell / Windows / Windows Shell / Babun - A Windows shell you will love! Just download the dist file from http://babun.github.io, unzip it and run the install.bat script. After a few minutes babun starts automatically. The application will be installed to the %USER_HOME%\.babun directory. 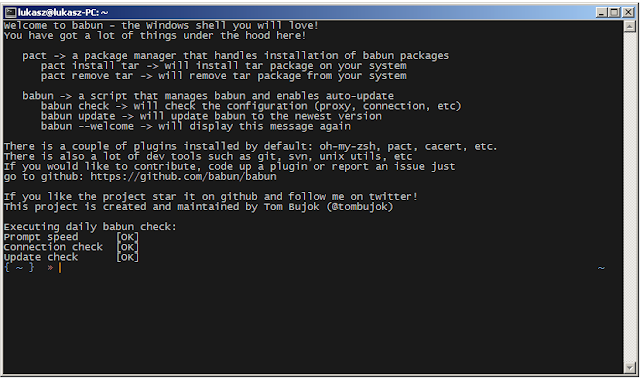 Use the /target option to install babun to a custom directory. The core of Babun consists of a pre-configured Cygwin. 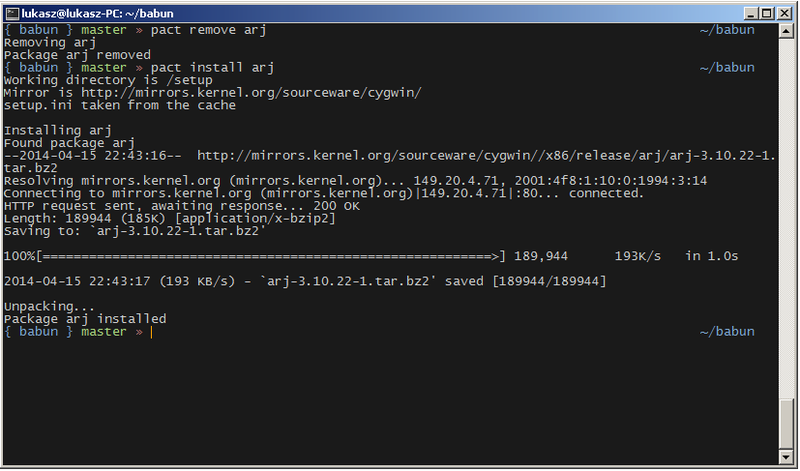 Cygwin is a great tool, but there’s a lot of quirks and tricks that makes you lose a lot of time to make it actually usable. Not only does babun solve most of these problems, but also contains a lot of vital packages, so that you can be productive from the very first minute. 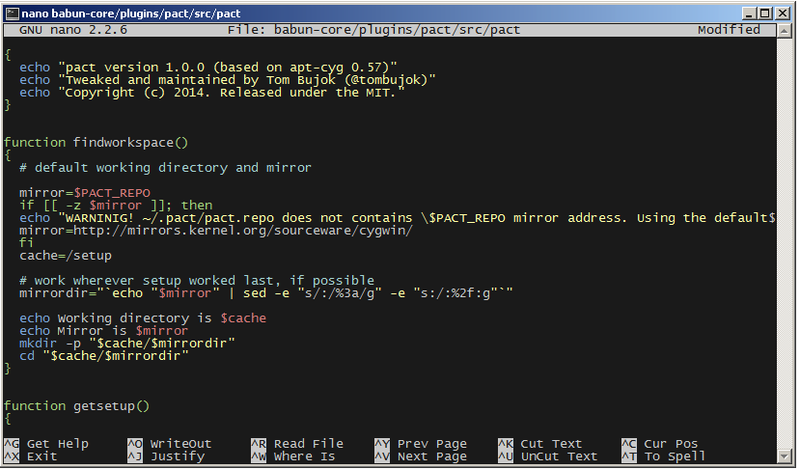 Babun provides a package manager called pact. It is similar to apt-get or yum. 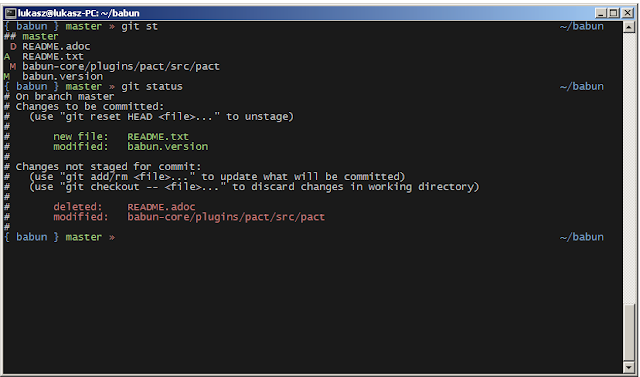 Pact enables installing/searching/upgrading and deinstalling cygwin packages with no hassle at all. Just invoke pact --help to check how to use it. Mintty is the console used in babun. It features an xterm-256 mode, nice fonts and simply looks great! 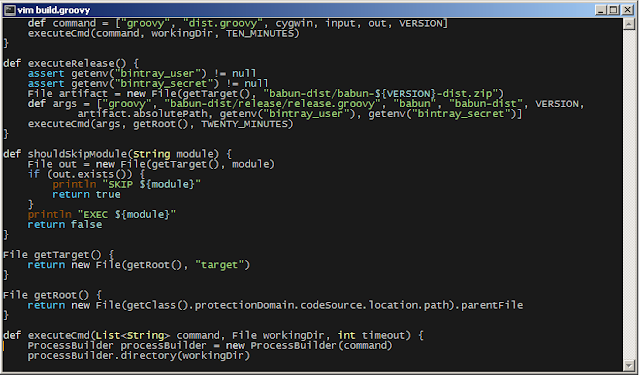 Babun supports HTTP proxying out of the box. Just add the address and the credentials of your HTTP proxy server to the .babunrc file located in your home folder and execute source .babunrc to enable HTTP proxying. SOCKS proxies are not supported for now. Self-update is at the very heart of babun! 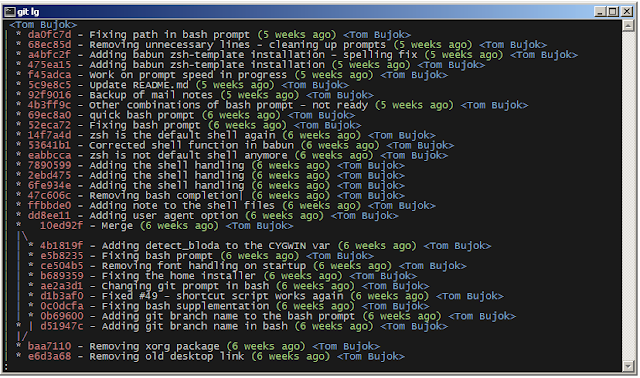 Many Cygwin tools are simple bash scripts - once you install them there is no chance of getting the newer version in a smooth way. You either delete the older version or overwrite it with the newest one losing all the changes you have made in between. Babun contains an auto-update feature which enables updating both the microkernel, the plugins and even the underlying cygwin. Files located in your home folder will never be deleted nor overwritten which preserves your local config and customizations. Babun features an silent command-line installation script that may be executed without admin rights on any Windows hosts. gitalias['alias.lg']="log --graph --pretty=format:'%Cred%h%Creset -%C(yellow)%d%Creset %s %Cgreen(%cr) %Cblue<%an>%Creset' --abbrev-commit --date=relative --all"
Connecting to mirrors.kernel.org (mirrors.kernel.org)|149.20.20.135|:80... connected. pact: Installs and removes Cygwin packages. 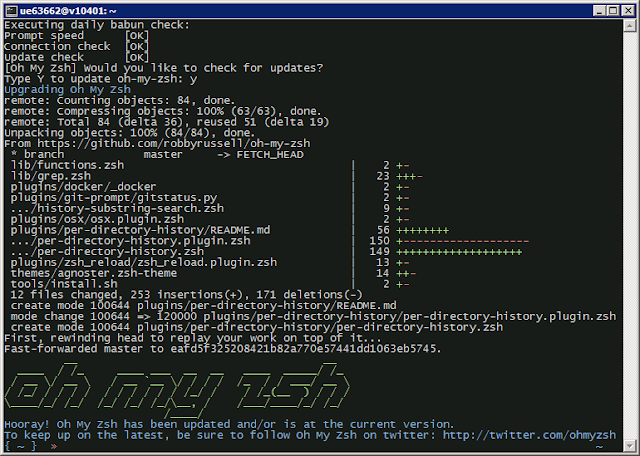 The zsh (with .oh-my-zsh) is the default babun’s shell. Hint: the underlying Cygwin kernel is outdated. 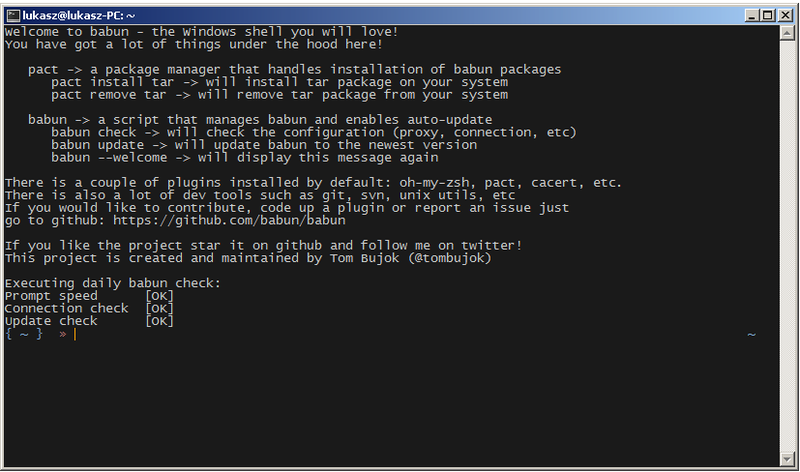 Execute 'babun update' and follow the instructions! 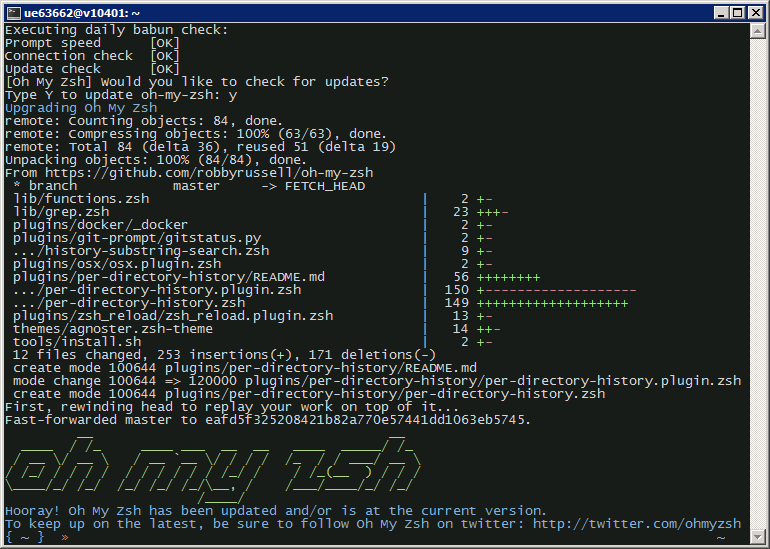 It will check if there are problems with the speed of the git prompt, if there’s access to the Internet or finally if you are running the newest version of babun. 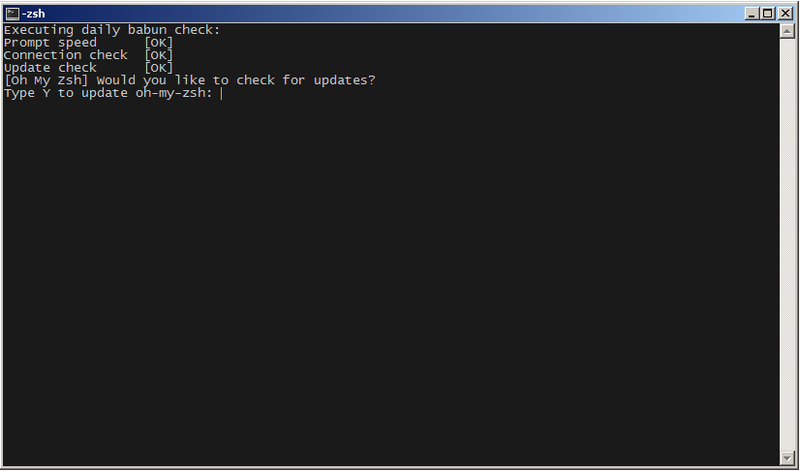 Hint: your prompt is very slow. Check the installed 'BLODA' software. On each startup, but only every 24 hours, babun will execute this check automatically. 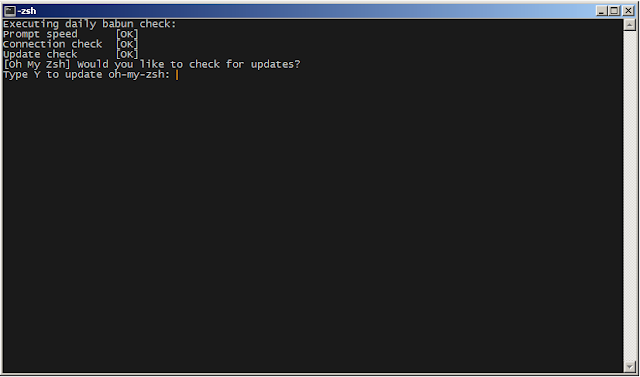 You can disable the automatic check in the ~/.babunrc file. Please note that your local configuration files will not be overwritten. 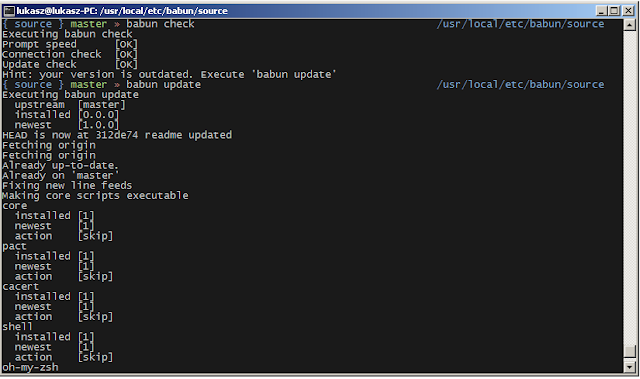 The babun update command will also update the underlying cygwin version if never version is available. In such case babun will download the new cygwin installer, close itself and start the cygwin installation process. 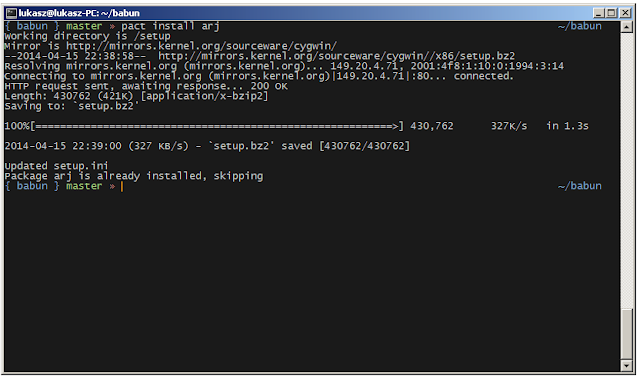 Once cygwin installation is completed babun will restart.